The BMW 507 roadster that belonged to its designer Albrecht Graf von Goertz and three racing Jaguars are the highlights of the Bonhams Bond Street 2018 sale in London. The leading cars for the Bonhams Bond Street 2018 sales are a 1958 BMW 507 Series II Roadster, a 1993 Jaguar XJ220C, a 1959 Lister Jaguar “Knobbly” and a 19895 Jaguar XJR6 Group C racing coupé. Top results are also expected from a 1966 Aston Martin DB6 Volante and a 1966 Ferrari 500 Superfast Series II Coupe. A 1937 Lagonda LG45 Rapide Tourer is the leading pre-war automobile in the sale. Bonhams will hold its traditional Bond Street sale at its London headquarters on 1 December 2018. This is traditionally the final major classic car sale of the year in Europe, although a few smaller sales, including Bonhams Olympia auction, are still held later in the December. The 1959 Lister-Jaguar “Knobbly” 3.8-Litre Sports-Racing Two-Seater, NBL660 / BHL103, is considered one of the finest genuine Lister-Jaguars. It was the third car produced and originally belonged to Peter Whitehead. It was raced in period from 1958 to 1963 and scored an impressive 29 wins and 53 podium finishes. Bonhams has also announced a Lister-Jaguar for its 2019 Scottsdale Sale: a former Team Cunningham 1959 Lister-Jaguar Sports Racer driven by Stirling Moss and Walt Hansgen, and the SCCA C-Modified National Championship Winner. The 1985 Jaguar XJR6 World Endurance Championship Group C Racing Coupe, chassis 285, was raced as a quasi-works car by TWR in British racing green and with prominent Jaguar branding. This XJR V12 was driven by Martin Brundle, Jean-Louis Schlesser, Jan Lammers and Mike Thackwell. It best finish was third in its debut race at Mosport Park in Canada. The 1993 Jaguar XJ 220C Competition Coupe, chassis 002, was the last Jaguar to have achieved a class victory at Le Mans. It was driven by David Coulthard, David Brabham and John Nielsen to GT class victory at Le Mans in 1993 as a Tom Walkinshaw Racing TWR car. 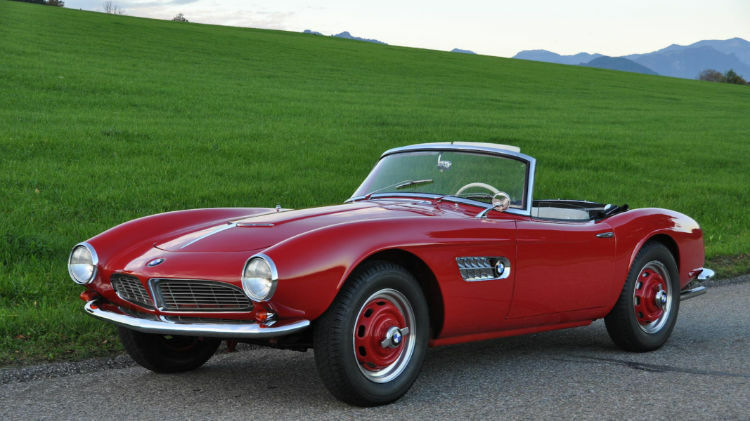 The 1958 BMW 507 Series II Roadster on offer at Bonhams’ Bond Street 2018 sale was once owned by the car’s designer – Count Albrecht Graf von Goertz. As only 252 cars were built, his 507 was not a gift from BMW or nicked off the production line but rather bought used (well pre-owned in BMW speak) by Von Goertz in 1971. He owned the car for around a decade. The BMW 507 was produced in much lower numbers than the Mercedes Benz 300 SL. At the time, it was more expensive than its three-pointed star rival and is still dearer at auction now. However, the estimate of $2,700,000 – 2,800,000 looks very high. 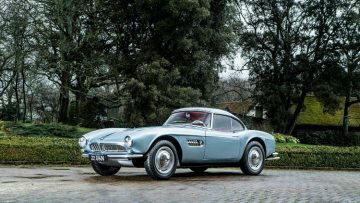 The model and BMW marque record of $5 million paid for John Surtees’ BMW 507 at Bonhams Goodwood 2018 remains safe, but a result inside the estimate will be one of the highest prices ever paid for a 507. The 507 on offer was last restored in the 1990s and has a replacement engine. Arguably better examples sold for less, or failed to reach reserve margins, in recent auctions. The 1966 Aston Martin DB6 4.2-litre Short-Chassis Volante was the sixth of only 37 short-chassis DB6 Volantes produced. It has a known ownership history from new. Aston Martin prices seemed a little less firm at recent auctions with fewer cars offered and achieving million dollar results. Scarcity should help this DB6 Volante. The 1966 Ferrari 500 Superfast Series II Coupe is one of only 37 Ferrari 500 Superfast cars produced and was the 8th of only 12 Series II cars built. It was the ultimate roadcar of its age but despite its scarcity never seemed to catch the imagination – and prices – of other Ferraris such as the 275 GTB. Prices for Ferrari 500 Superfasts at recent auctions were mostly in the $2 to $3 million band. The owner of this 1966 Ferrari 500 Superfast Series II Coupe seems keen to sell. The 1937 Lagonda LG45 Rapide Tourer, Registration no. ELB 396, was a pre-war supercar capable of exceeding 100 mph. Only 25 were ever built of which a remarkable 24 survived. One of these set the model record at the 2015 Bonhams London sale when it achieved £785,500 ($1,189,212). The record car was sold from single-family ownership while the model on offer had eight owners from new. The Bond Street Sale in London is traditionally the final million-dollar cars sale of Bonhams while the Scottsdale sale in mid-January will kick off the new auction year in the USA.